FREE BOOK LIMITED TIME ONLY. Faelynn LeCroix is a woman hell-bent on finding those responsible for the brutal murder of her mother and the abduction of her father. She’s on a quest for revenge and, in her opinion, the bloodier the better. 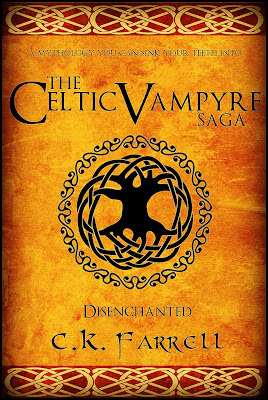 The arduous trail that she has been doggedly following for three years has led her directly into the path of Nathaniel Valour, an Irish vampyre who rules over the territory of New England. At first, she sees him as nothing more than one of the fiends she disposes of on a nightly basis, but something tells her that Nathaniel is different from every other vampyre she has ever encountered on her trail of retribution. The truth is, Nathaniel Valour is different—he is a vampyre with a secret. Upon looking into the eyes of Faelynn, Nathaniel realises that she is the one he has unknowingly been waiting for. Can Faelynn see beyond her situation and place her fragile trust in the hands of a depraved creature of the night, one she swore to destroy every last one of? If she can, Faelynn may find herself closer than ever to quenching her thirst for vengeance.